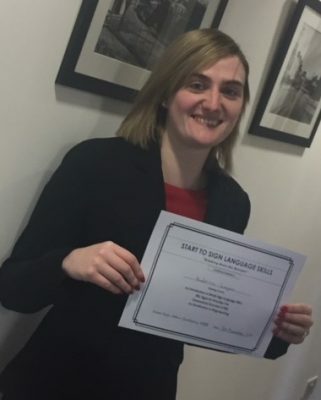 Our Katrina Lagan, solicitor attended the Introduction to British Sign Language Course at Law Society House on Tuesday 20th November 2018. The course, led by tutor John Carberry MBE was very engaging and insightful. The students learnt about the deaf community and some of the struggles they experience. Students were also taught basic signs and finger spelling including the alphabet and numbers one to ten. Katrina would advise that the course was very engaging and extremely useful and she would highly recommend it.